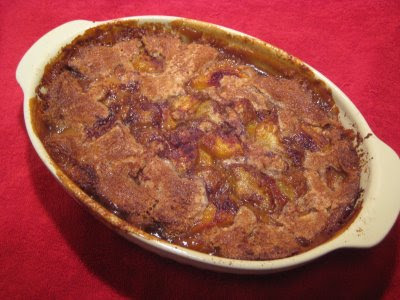 How is it that I've gone this long without posting a recipe for peach cobbler? One would think that I'd have made one at some point. What's up with that? As the crust bakes up from the bottom, it gives the top a 'cobbled' appearance. So now you know! Melt the butter in a small saute pan over medium-high heat until it bubbles and turns golden-brown. Pour the butter into a large shallow oval casserole dish. (9x13 also works well). Swirl it around so it coats all sides. In a medium bowl, stir together the sugar, flour, baking powder, cinnamon, and milk. Pour the batter on top of the melted butter. Do not stir. Arrange the peaches evenly on top of the batter. Evenly sprinkle the brown sugar over the peaches. Sprinkle a little more cinnamon over the top, if you like. Place the casserole dish on a baking sheet and bake the cobbler for about an hour or until the top is set and golden brown. The batter will bake up from the bottom of the pan to partially cover the peaches. Serve warm with vanilla or peach ice cream. Be sure to place your casserole dish on a baking tray, just in case your cobbler decides it wants to bake up over the sides of the dish. To peel peaches, use the same technique as when you peel a tomato. Simply place your peaches in a pot of rapidly boiling water for about 30 seconds. Remove them and let them cool for a few minutes. The skins slip right off! This recipe works beautifully with other kinds of fruit. It would be absolutely delicious if you combined flavors. How about apple rhubarb?? or peach blueberry? Use whatever fruit is the freshest!